7th Avenue between 46th and 45th is home to one more "build it up" location. This one-story building has been gutted and it has high hopes of becoming a three-story building. I think that soon we'll have three floors of rentals available. Hopefully the 2nd and 3rd floor additions will bear some resemblance to the 1st floor facade. Don't forget about the lovely look to this building, quite nearby. 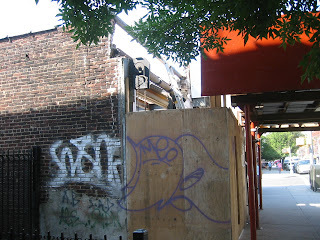 Does the purple graffiti look like a swimming fish to anyone else?